Yesterday, on an Avalon Bay Job Sit in Teaneck NJ, the local Fire Chiefs show up to test Mighty Fire Breaker™ Job Site spray with flares. Their overall response was "Wow that stuff really defends fire from igniting and advancing"! M-Fire is out to do even more than defend our greats builders from all the arson strikes that hav been taking place across the USA with wood framed buildings. In fact, just last week there was another fire in LA that was started under a building podium again between 1AM and 3AM, like many do. Fortunately, as the dumpster was gaining energy the LA Firefighters arrived just in time before the fire climbed high enough to catch hold of the building like it was intended to do. We will be looking for that builder this week to see if they want M-Fire to help defend that building as we did in Berkley for another builder. 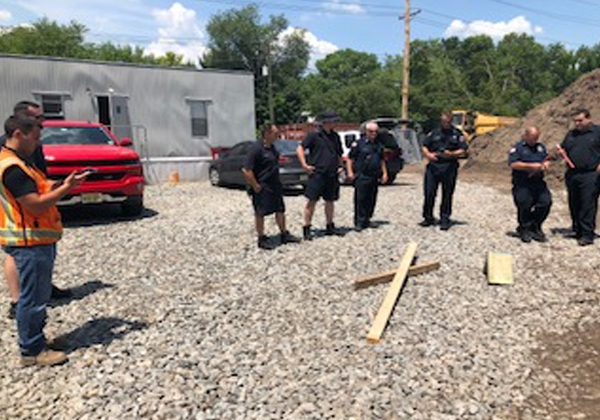 Soon we will be introducing even more to help our Fire Chiefs make those tough decisions on whether to send firefighters into an unoccupied wood framed building. We will will be able to deliver real time data to the Fire Chiefs with our M-Fire APP. Fire Chiefs are more willing to send firefighters into wood framed buildings if Might Fire Breaker™ was applied to slow the advance of fire, whether its an arson strike or even if it's fuel. If you are a General Contractor, constructing a wood framed building for an owner why would you take this kind of risk after 2 construction workers were killed, during the middle of the day in Denver by an arsons torch? Call us for a price on each job to make your job sites safer. There is a great chance the Broker and Risk Managers Underwriters will reduce premiums to cover your cost to lower the risk of a total loss. Just this week, M-Fire's GM met with a large Insurance Broker that was introducing M-Fire's Mihty Fire Breaker™ to their clients. In every meeting they told there clients they would challenge the Underwriters to lower the premiums for this type of 100% fire protection on all their wood framed jobs.